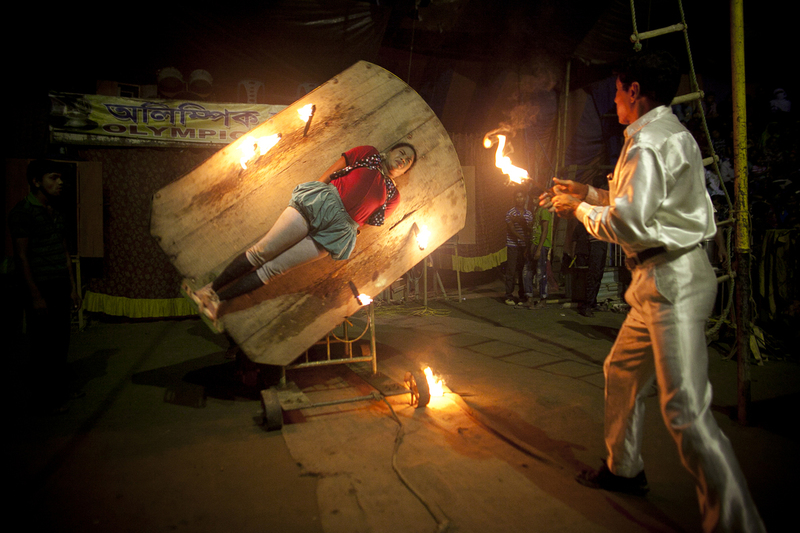 Sheuliy, shuts her eyes as Rezaul Karim throws flaming knives at her during a performance at the Olympic Circus. Sheuliy, who doesn't know her age, got married to another circus worker when she was 10 or 11 years old. She never had a chance to go to school. Rezaul, who is 52 years old, joined the circus when he was a teenager. He dropped out of school when he was 12 years old. Rezaul enjoys his work in the circus. He like performing and watching his friends perform, and he enjoys the music.